Adah Chung has been a freelance writer since 2008. She is published on websites such as Work.com and in the "Perspective on Physician Assistant Education" journal. Along with writing, she is also an occupational therapist. Chung held a faculty position in medical education at the University of Colorado and has a master's degree in education from the University of Toronto in Canada. Chinese tea has different varieties: green, white, oolong, red; they are differentiated by the type of leaves used to make the tea. Although an 8 oz. coffee contains approximately 100 mg of caffeine, an 8 oz. cup of Chinese tea contains approximately 30 mg. of caffeine. With the lower caffeine content in Chinese tea, many people find this drink an appealing alternative to other caffeinated beverages. Chinese tea has health benefits, such as lowering blood pressure and cholesterol, and it contains antioxidants, which helps to boost the immune system. However, drinking Chinese tea can also produce side effects. Chinese green tea has the least amount of caffeine of the Chinese teas; it can range from 8 to 36 mg of caffeine, while Chinese oolong tea has 12 to 55 mg of caffeine. The caffeine content in Chinese tea varies with the temperature of water that the leaves are steeped in, the amount of leaves used and the length of time the leaves are steeped in hot water. Consumption of too much caffeine can cause side effects such as restlessness, insomnia, upset stomach, diarrhea, irritability or increased heart rate. For pregnant women, excessive caffeine intake can restrict blood flow to the placenta, creating low birth weight and faster breathing and heart rates in babies after birth. The "American Journal of Clinical Nutrition" in 2001 published a study in which green tea was found to prevent the absorption of iron by 25 percent. Iron deficiency, or anemia, can be prevented when drinking Chinese green tea by avoiding drinking full-strength tea, by avoiding drinking tea with a meal and by limiting the number of cups of tea consumed daily. Chinese tea does contain epigallocatechin (EGCG), which is a powerful antioxidant. It can interfere with the absorption of folic acid, which is necessary for fetal development. This is a particularly significant side effect for pregnant women. It is unknown how this specifically affects fetal development, so drinking Chinese tea during pregnancy only in small amounts is recommended. Some drugs can cause interactions with Chinese green tea. Antibiotics can interfere with the breakdown of caffeine in the body and increase headaches, irritability or rapid heart rate. Because Chinese tea contains vitamin K, it can reduce the effectiveness of anticoagulant drugs (for blood-clotting problems). Similarly, aspirin used in conjunction with Chinese green tea can prevent blood clotting and increase risk of bleeding. Monoamine oxidase inhibitors (MAOIs), which are used to treat depression, can cause a significant increase in blood pressure when taken together with Chinese green tea. In 2006, a study by the University of Toronto found that concentrated doses of green tea polyphenols caused liver toxicity in mice. 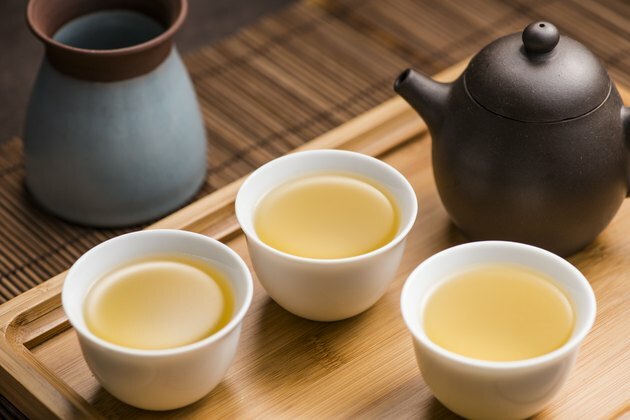 Chinese tea taken as a beverage does not have as high a dosage of polyphenols as green tea supplements, but it is important to remember that drinking Chinese tea in moderation is key. "Medical News Today: Green Tea Polyphenols May Cause Liver Damage in High Doses"
What Can Happen After Drinking a Lot of Tea per Day?